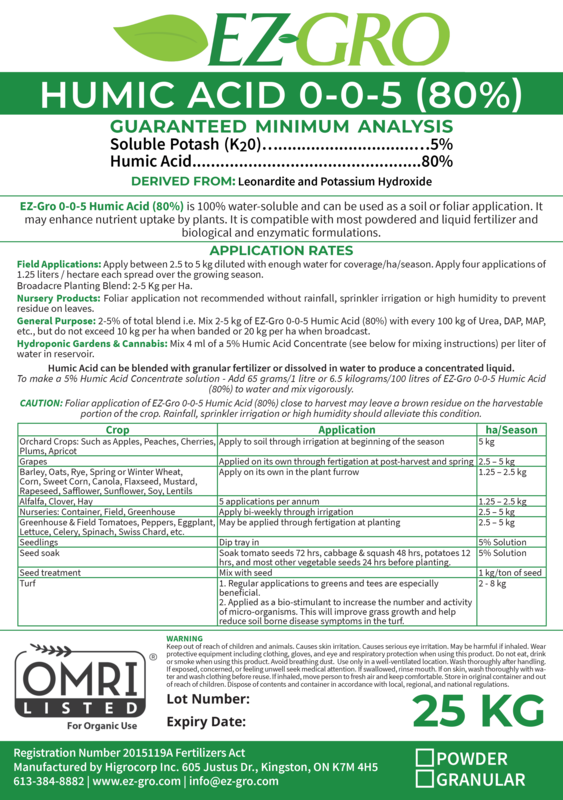 EZ-Gro Humic Acid is an organic non-plant food soil or foliar treatment that is 100% water-soluble and offers many benefits to your soil and crops. It is considered an efficient and effective method to enhance the uptake of endogenous and exogenous nutrients, allowing it to optimize your current fertilizer program. Humic acid has been shown to enhance soil structure and fertility, alter nutrient root architecture to improve nutrient uptake, and even reduce metal toxicity through its chelating properties. Apply EZ-Gro Humic Acid with your regular fertilizer program to stimulate germination, enhance root, leaf and shoot growth, and protect your plants against heavy metal toxicity.